Venue: St Saviour’s Church in Brookwood. This is a charity concert to continue with my project to raise funds to help with the restoration of two Estonia Grand Pianos that are in two major music Conservatoires in Havana. These were the schools where I studied and worked later on. At the moment we have been able to buy one set of hammers for one of the pianos. We still need more donations to buy another set of hammers along with new strings, a set of pedals and a castor wheel. 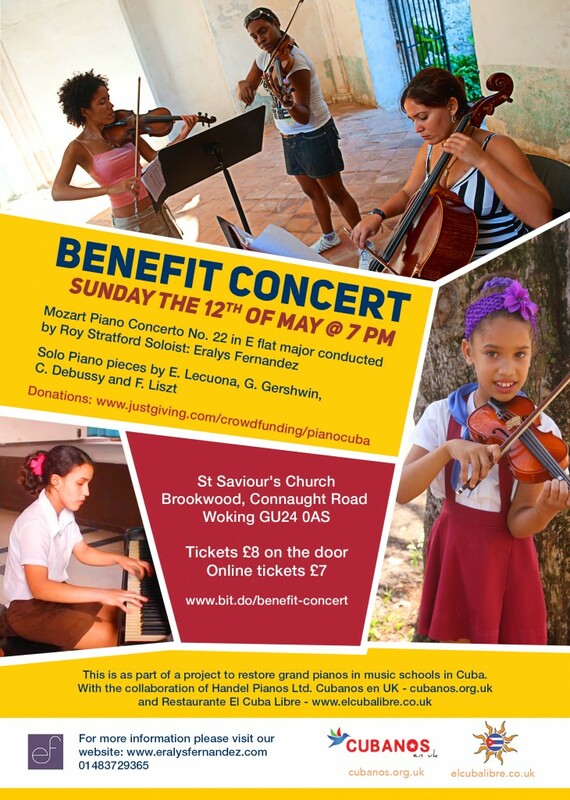 For this event, I have got conductor Roy Stratford from the Woking Symphony Orchestra along with professional musicians and amateurs who will kindly come and perform Mozart Piano Concerto No. 22 in E flat major. I have played this concerto with other orchestras in the past, including the National Symphony Orchestra in Havana. This is a great adventure bringing all these people to play together on that night.